This was in 1996. The air of Delhi was black with smog. 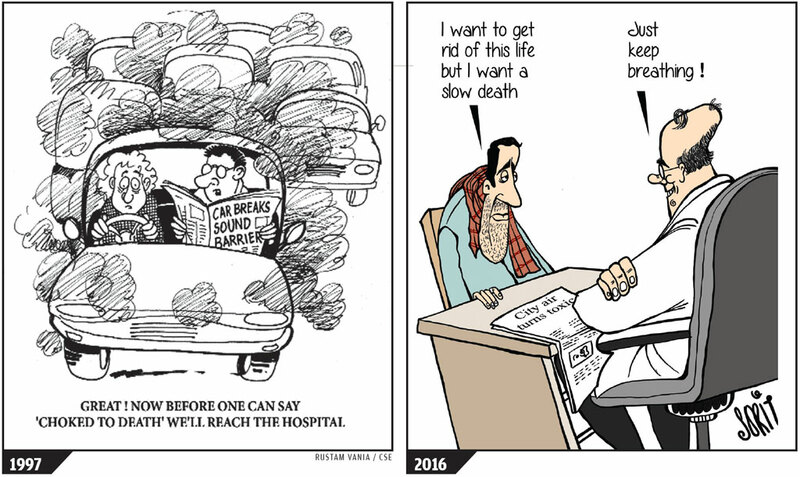 The difference between then and now—when smog is back with a vengeance—is that Delhi did not know what had engulfed it. It was breathing poison. But it did not know as dirty air had crept upon it. There was no information about air pollution and its hazards. We just thought it was dark winter days. This is when the Centre for Science and Environment (CSE) began its work on air pollution. 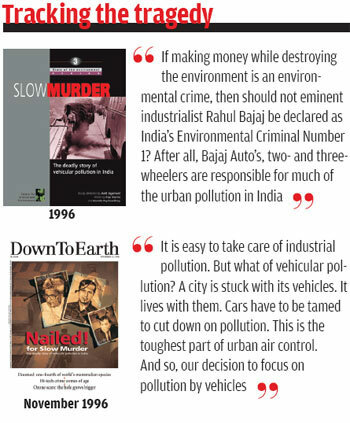 It was in November 1996—20 years ago—that we published Slow Murder—the deadly story of vehicular pollution in India. The book started with an investigation into the pollution-under-control system; it asked if Delhi or any city could clean its air by checking the tailpipe emissions of each car. It asked if we needed more measures—from emission technology to fuel quality. This was the first such enquiry and it brought results. It was also the first time that CSE was not only doing research, but decided that this was a fight to the finish. Slow Murder would launch a campaign to fix what we had found was wrong with Delhi’s air. Remember, this was the time when air pollution was not on the discussion table. It was not on anyone’s agenda. In fact, the question we were asked more than once was: why were we so worried about some black air. The then Lieutenant Governor of Delhi had said that this was only dust. Nothing to be worried about! The then health minister said air pollution was not a health concern. We deliberately called the book, Slow Murder, as pollution did not kill instantly, but led to the suppression of the body’s immune system, destroying lung function or adding to the cancer and cardiovascular disease burden. It was slow, but murder nevertheless. We indicted government and industry. We put three faces on the cover of Down To Earth (November 15, 1996); the Minister of Environment and Forests, Jai Narain Prasad Nishad; T R Baalu, the Minister of Petroleum (there was no natural gas then); and, Rahul Bajaj, the owner of Bajaj Motors and then India’s sole auto king. Why? Because our research had shown that proposals for vehicular standards were being shuffled between agencies. This was the time when India had no Bharat Stage (BS) I or II vehicle emission standards. We had nothing. The proposal for cleaner fuels was being similarly bandied about, without any resolution. This was the time when fuel had 10,000 parts per million (ppm) and above of sulphur (today, with BS IV, sulphur is down to 50 ppm, and this will go down to 10 ppm by 2020 when we enforce BS VI). Rahul Bajaj was on the cover because of the extremely polluting 2-stroke technology that two-three wheelers used. Bajaj had a monopoly on vehicles at the time—this is before the advent of 4-stroke technology, which saw the rise of Hero Honda, and, personal car mobility, which saw the rise of Maruti-Suzuki and then other companies. Our agenda was not personal. It was to bring policy for fuel-technology standards and to use this to drive out polluting vehicles. This is what we now call the first generation reform. We were young and we were angry. But first, we did what gentrified researchers do. The then Vice President of India, K R Narayanan agreed to release the book in the Vice President’s residence. It brought attention. We followed this with a public meeting—our first—at the capital’s FICCI auditorium. We said, cough, wheeze, suffocate or its time to take a stand. This was in November 1996. But as it happens, nothing really moved. A year went by. The automobile industry pushed against any reform and the government shuffled papers. In 1997, we again went to the public. This time, we had data to show the number of deaths because of pollution. Our analysis (based on a World Bank model) showed that in just four years—between 1991 and 1995—there had been a shocking 30 per cent increase in the number of premature deaths because of air pollution. Cardiologist Naresh Trehan shared with us two photographs of lungs. He said when he operated he knew where the patients hailed from the colour of their lungs. The first photograph was that of a Delhite, Trehan said. Even non-smokers from Delhi had black lungs. The second photograph was that of a resident from Himachal Pradesh who had pink lungs. All this spurred action. In December 1997, the then Union Minister of Environment and Forests (MOEF), Saifuddin Soz, issued a white paper on pollution in Delhi, which became the basis of an action plan. In January 1998, the MOEF constituted the Environment Pollution (Prevention & Control) Authority (EPCA) for the National Capital Region (NCR). In June, 1998, EPCA released its first report on priority actions, in which it detailed steps that were needed to clean Delhi’s air. These included control on diesel vehicles and a move towards Compressed Natural Gas (CNG). In July, the Supreme Court’s (SC) top bench, then headed by Chief Justice A S Anand, issued directions based on EPCA’s report with deadlines. It set a deadline for conversion of all three-wheelers and diesel buses to CNG. Delhi was now on schedule for a clean-up. But even as the SC proposed, the government deposed. Powerful vested interests reigned. They did not allow anything to move. Why? Because diesel had big friends. This was also the time when science had discovered the real pollution villain—small particulates. Till then, we had only one pollutant in our lexicon, Suspended Particulate Matter or SPM. Now evidence showed that what was really toxic was the smaller particulates, then called Respirable Suspended Particulate Matter (RSPM), because they are small enough to inhale. The first survey of RSPM—later called PM 10 and then PM 2.5 as the size of the particulate became clearer and its deadly toxicity better understood—was done in 1998. Monitoring by the Central Pollution Control Board (CPCB) showed that the level of RSPM was five times above the national 24-hour standard. This was deadly. But where did RSPM come from, we asked? By then global research was pointing at diesel—depending on the size and toxicity of the particulate; and explaining not just on how the fuel was burnt, but also the nature of the fuel itself. Studies had found that 90 per cent of the exhaust from a diesel vehicle was below 1 micron in size; it was coated in highly carcinogenic poly-aromatic hydrocarbons (PAH) and other toxins. In 1998, after a decade of work, the California Air Resources Board formally designated diesel particulates as toxic air contaminants. This was then followed by studies from Japan, which discovered the most potent carcinogen in diesel exhaust. This news was unpalatable to the automobile industry. They hit back and things got messy. Really messy. In 1998, the car industry was about to bloom—old players like Hindustan Motors, with its Ambassador car, were being edged out by the zippy Maruti Suzukis and Hyundais. And waiting in the wings was Telco, or now Tata Motors, which till then, had a grand presence only in the commercial truck and bus segments. Tata Motors had worked out a scheme to break into the Japanese-Korean-dominated car industry with a product that was not only savvy, but also cheap. How? It would use diesel, which was till then reserved for public transport. It was just about to launch the diesel-powered Sumo. This was unacceptable for pollution control. EPCA (with CSE’s director, Anil Agarwal, as a member) had already petitioned the SC asking for diesel to be banned for use in buses. We wanted the fleet to move to cleaner CNG. Clearly, we did not want cars to also use the dirty and toxic diesel. In 1999, we published a report, titled provocatively, Engines of the Devil—why dieselisation of the private automobile fleet should be banned. Tata Motors was not amused. In April 1999, Tata Motors sued us for defamation, slapping us with a case of Rs 100 crore for writing an article in Business Standard on the toxicity of diesel. We took the matter to the public. Tata withdrew the notice, but the fight moved underground. Tata Motors hired a public relations firm, Burson-Marsteller Roger Pereira Communications, to campaign for diesel. 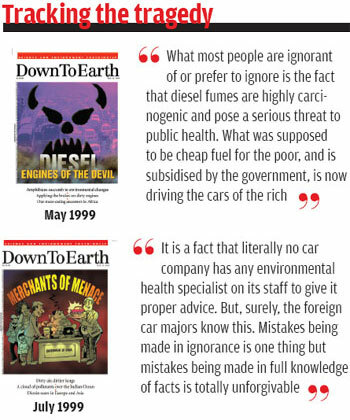 We soon found pamphlets (this was before the age of the Internet) on myths and facts about diesel, which quoted anonymous experts, on the tables of all decision-makers. Many non-profits sprung up to defend diesel. One was called Citizens Against Pollution, which had a one-point agenda to defend diesel. Disinformation became the name of the game. But this did not deter us. EPCA had already started working on this issue. 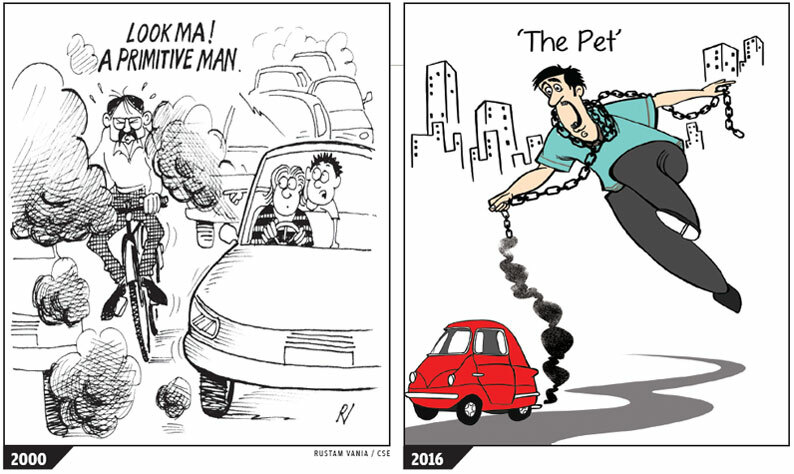 In April 1999, it submitted a report to the SC on restrictions for plying diesel-driven (private) vehicles in NCR. It called for a ban based on emerging public health issues and the extent of pollution in Delhi. The apex court was listening. The SC-appointed amicus curiae, Harish Salve (who continues to play this role with great commitment), took up the matter asking for the “forthwith suspension of registration of diesel vehicles until further orders”. The learned judges of the country’s apex court concurred, saying that the “very right to life of the citizens is at stake”. The government was asked to respond. The fight became dirty; personal attacks on CSE’s director Anil Agarwal, who was then battling a serious form of cancer, became common. The automobile industry, led by Tata Motors, used their full might to defeat this move. In court, Tata Motors lawyers, F S Nariman and Arun Jaitley (yes the same), P Chidambaram for Fiat (also, the same) and Kapil Sibal for Maruti (also, the same) argued that particulate matter was not dangerous. Tata Motors’ affidavit in court said, “I deny that smaller the particulate, the more harmful it is.” “I deny that RSPM is more deadly because they are breathed deep into the lungs and lodged there.” I deny, I deny. This was the refrain. The SC, faced with this barrage of opposition from the industry, decided that instead of banning diesel for private cars, it would push for a drastic improvement in fuel and emission standards. Meanwhile, the government believed it was not its war at all. So in April 1999, the SC gave its sentence. It said that only those vehicles that were Euro I compliant could be registered in the NCR as of June 1999; but it gave only one year for the transition to Euro II. It directed that from April 1, 2000, only Euro II vehicles could be registered. In the interim—May 1, 1999 to April 1, 2000—it set a quota for 250 diesel cars per month and 1,250 petrol cars per month to be registered in the NCR on a first-come-first-served basis. In one stroke, the apex court introduced emission standards for vehicle technology and fuels, and gave the automobile industry six months to make the transition. The rest is history. The automobile industry met the deadline. The oil industry provided cleaner fuel. The air of Delhi benefitted. But we had lost the critical fight—private diesel cars zoomed ahead. Clean air benefits were squandered away. But more on this later. We were in the Chief Justice Court, SC, on February 16, 2001. The final deadline of April 2001 for converting all buses, autos and taxis to CNG to reduce toxic diesel particulate pollution was very close. The Delhi government wanted the deadline to be extended by another three years. The SC rejected the plea. This was just the beginning of the shadow of things to come. Delhi was turning into a battlefield to block CNG implementation. The judges said giving a “blanket extension would amount to putting a premium on the lapses and inaction of the administration and private transport operators”. Only a limited extension was granted till September 30, 2001, but with rigid conditions. The then principal secretary, transport, was made personally responsible for compliance; diesel buses would be allowed to ply only with his authorisation. As diesel buses were decommissioned, violence erupted on April 3, 2001. Angry commuters resorted to arson and set buses ablaze. Politicians too started the blame game for the rioting. “Anti-CNG lobby does a war dance” was the headline in The Indian Express on the morning of April 7. Media quoted lawyers saying that the matter was leading to a constitutional crisis. On April 4, the court said it was “distressed at... defiant attitude on the part of the Delhi administration to comply with our orders. The attitude is wholly objectionable and not acceptable”. Fearing contempt proceedings, the Delhi government filed an affidavit on April 18, saying it was committed to implement the court’s directions. The contempt proceedings were dropped on April 27. The matter was reduced to a puerile high school debate on CNG v diesel. Saboteurs started a game of zeroes to block CNG. Detractors advocated the use of ultra low sulphur diesel, with less than 0.005 per cent sulphur, as an alternative to CNG. But when asked to make a recommendation to the court, through the EPCA, it quietly mentioned low sulphur diesel (0.05 per cent), which is the Bharat Stage II fuel standard. Deleting a zero was clever; to confuse the court with an alternative that did not exist. Then came the bogey that there was no gas, and that CNG was unworkable. CNG was potrayed as anti-poor. The plight of bus and auto drivers waiting in long queues made hearts bleed. This was used to whip up anger against CNG. The government claimed the city’s transport could not run on one fuel, as any hitch in the pipeline could bring the city to a halt, and demanded that the EPCA recommend 0.05 per cent sulphur diesel as a world standard clean fuel. Detractors spawned myths claiming that CNG is unsafe and emits more ultrafine particulates; CNG causes cancer, and not diesel. A study conducted for a bus and truck engine manufacturer in the US got baptised as a Harvard study, and found its way to every policymaker to debunk CNG. We had to counter this disinformation to clear the smokescreen of lies. Everyone seemed to have missed the point that the SC was not promoting CNG or any specific fuel, but was only trying to clean up the air. The original order of July 28, 1998, had asked for CNG and other clean fuels. Following directions, the EPCA defined clean fuels in 2001, and specified CNG, LPG, unleaded petrol with low benzene used with catalytic converters, and clean diesel with 10 ppm sulphur used with advanced particulate traps as alternatives. The Union government then submitted a hurried interim report of the newly-constituted Auto Fuel Policy Committee to the court, asking it to not prescribe fuels and technology, but only set emissions standards. We said such an approach would not work as Euro II diesel buses emit 46 times higher particulate matter than CNG. It is diesel emissions that the WHO has branded as a carcinogen for its clear links with lung cancer. After several missed deadlines, Salve reacted in the court in March 2002: “This is the fifth time that the Union and state governments were coming to court with the prayer that diesel buses be allowed. If this was a private party, it would amount to abuse of process and the party would be made to pay the costs.” In April 2002, the SC brought down the curtains on the capital’s diesel buses. It imposed a penalty of Rs 1,000 per diesel bus per day, and slapped a penalty on the Union government for repeatedly seeking a modification of the CNG order. This helped change the focus from resistance to implementation. Bus operators threatened to protest, but this time the state government did not back down. Sensing that the government had changed its mood, bus operators were back on the roads, paying fines and buying new CNG buses. On December 1, 2002, media reported: “Finally its bye bye diesel buses”. But for us, the work was not yet over. Actual implementation threw up several glitches, largely related to the quality of CNG conversion, safety and inspection issues. We brought an international expert team to assess the CNG technology and conversion for remedial measures and a robust roadmap. This helped to frame the emissions and safety regulations for the CNG technology. We will never forget how we were surrounded by irate bus operators and faced public abuse and hate mails. Or the time when the police, instead of making oil companies accountable for fuel adulteration, turned up at our doorsteps to take us as witnesses against oil tanker drivers, whom we had photo documented to expose indiscipline in fuel transportation in the capital. The CNG crisis had affected everyone in Delhi. Once implemented, there was palpable public recognition that CNG had improved the capital’s air quality. 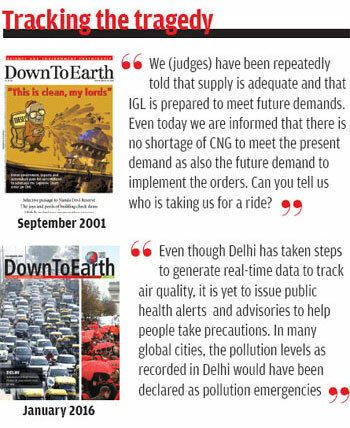 Before the Delhi assembly elections in 2003, political parties vied with each other to take credit for CNG. Delhi’s democracy had matured. It was time to take stock and refocus. While the clean fuel and technology agenda remained un-finished, the exploding number of cars and two-wheelers threatened to undo the incremental gains. We realised that the game of pollution control cannot be won by simply catching up, but only by leaping ahead. We presented a statement of concern to the SC in 2004. It said the SC directives had helped to stabilise air pollution levels. But the breathing space that Delhi had gained could be lost if vehicle numbers and congestion increased overwhel-mingly. We asked for a firm action plan for an inte-grated public transport strategy and vehicle restraint measures. Salve converted the statement of concern into an interim application. The Chief Justice bench served a notice to the Delhi government for a strategy to control vehicle numbers and congestion. For the first time, the Delhi government sub-mitted a plan for an integrated network of metro and bus rapid transit networks, and light rail, specifying agencies and timelines for implementation. We then pitched for a parking strategy and vehicle taxation to restrain car numbers and usage. In 2006, the EPCA submitted a parking strategy to the SC. It stated: “Land is limited and there is a limit to the additional parking space that can be created. Parking for personal motorised vehicles cannot be considered as a matter of public good. The “user pays” principle should govern the pricing of parking and not subsidised.” The SC took this on board and issued directives for a parking policy to reduce the demand for parking. Unfortunately, the proposals from the Municipal Corporation of Delhi (MCD), Delhi Development Authority (DDA) and New Delhi Municipal Council (NDMC) to the SC during 2008-09 missed the point, as they proposed to increase the parking space only. The principle of managing and reducing parking demand was lost. We had to wage a war to stop the conversion of green areas and parks for construction of parking lots. EPCA had to get the Delhi Master Plan amended to stop this practice. We saw the Commonwealth Games in 2010 as an opportunity. We visited Beijing to see what the Chinese government had done during the Beijing Olympics to clean up the air. We presented an action agenda to the Delhi government. At a high-level meeting, Sheila Dikshit, former chief minister, reviewed the air pollution control strategies for the Games, and framed a contingency plan. Delhi got new modern buses and implemented protected bus lanes, restrictions on private vehicle movement and higher parking charges for cars during the Games. Cycle and pedestrian paths were created; Bharat Stage IV emissions standards were enforced; and, action was taken against pollution from thermal power plants. In 2009, our “walkability” audit of Delhi’s roads exposed the dismal state of footpaths that discouraged walking and the use of public transport. About 40 km of footpaths were built around the venues of the Games. Post-Commonwealth Games was a lull period. There was nothing substantial, except a few more kilometres of metro lines and buses. The rapidly growing car owning middle-class, enjoying hidden subsidies for cars and two-wheelers, were not ready to support car restraint measures. They blocked the equitable sharing of road space with walkers, cyclists and buses; resisted parking restraints and higher parking charges. Meanwhile, unveiling of the cheap Nano car whipped up car-buying passions. We said that our city needs mobility, not cars—whether small, cheap, big, or expensive. During this period, peak oil prices rapidly shifted the market towards diesel cars adding to the toxic woes. Meanwhile, under the Air Act, 1981, a pollution cess was slapped on diesel fuel to create the Air Ambience Fund. But the diesel industry tried everything to block higher taxes on diesel cars and also, tighter emissions standards. It resorted to a misleading number game to prove that pollution from diesel cars did not matter. During this phase, action was slow, but the policy language and politics around public health and mobility began to change. The city was no longer in denial mode, as in the past. But acceptance also did not lead to effective action. We got involved with the revision of the Delhi Master Plan that took on board the principles of reinventing mobility. 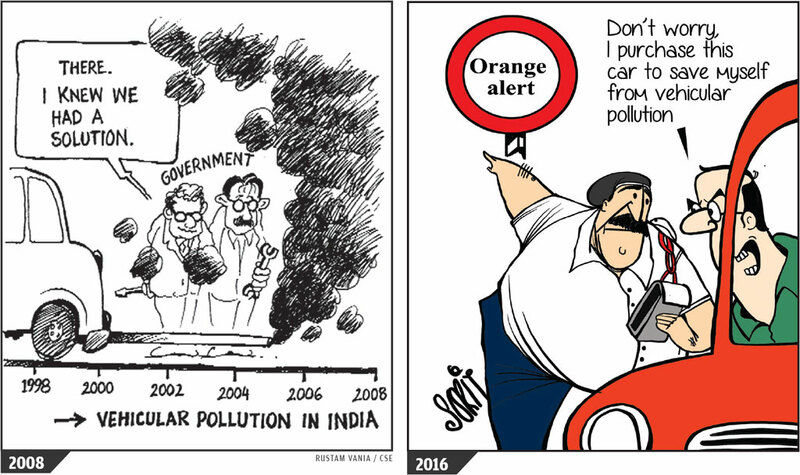 By now, public awareness and the rhetoric around polluted air was much sharper than it was 20 years ago. Noticing this change was more important than getting cynical about conservative forces fighting against change. October 2015 was yet another turning point. The SC stepped in once again to combat Delhi’s deadly winter pollution. Through successive winters, the capital was waking up to more wheeze, cough and suffocation. We were continuously tracking evidence on pollution trends, health and sources to raise fuss and push for action. This time the science was stronger. A new source inventory and apportionment study by the Indian Institute of Technology (IIT), Kanpur, ranked key polluters in the city, and also found diesel cars responsible for 70-80 per cent of PM 2.5 from vehicles. This allowed better source-wise decisions. The SC cracked the whip on toxic diesel emissions from trucks, cars and taxis; waste burning; construction and road dust; and, called for enhancing public transport, walking and cycling infrastructure. 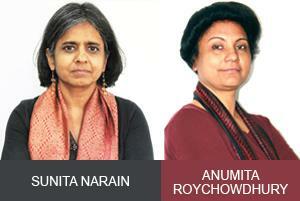 The focus now shifted from the local to the regional air-shed of Delhi. The SC’s directives now included not only Delhi, but the entire National Capital Region. This helped nail the episodic problem of farm fires in Punjab and Haryana. We were able to bring the attention back to the toxic diesel emissions from trucks. We counted trucks at the borders and found that the official numbers were grossly underestimated, and, it was cheaper for trucks to go through Delhi than take the toll roads outside. This data provoked significant decisions when EPCA shared this information with the SC. The apex court evoked the “polluter pays” principle and imposed an environment compensation charge on each truck entry and banned pre-2006 trucks. Within a month, truck numbers dropped by about 20 per cent, lowering night-time pollution and shaving off winter pollution peaks. The court rulings also finally established that diesel cars are more polluting. Misuse of low-taxed diesel by cars came under fire. The SC, in its ruling of December 16, 2015, said: “It is noteworthy that diesel vehicles of 2,000 CC and above and SUVs are generally used by more affluent sections of our society and …more prone to cause higher levels of pollution.” The court imposed a temporary ban on big diesel cars and SUVs for the winter. History repeated itself when the car industry opposed the SC’s move to nail diesel cars with the polluter pay principle. The judges said this will make people aware that they are buying more polluting vehicles. While the pending proposal from EPCA shows that diesel cars should pay at least 20 per cent of the car value to pay for the extra fuel tax that petrol cars pay over lifetime, the diesel car industry got away by volunteering a mere 1 per cent environment compensation charge to escape the ban. The heat on diesel catalysed the momentous step taken by the Union government on September 16, 2016, to skip Euro V and directly leapfrog to Euro VI emissions standards by 2020. Only at this level do petrol and diesel emissions nearly equalise. This is a game-changing decision. As the previous winter witnessed several smog episodes, public outcry led to the first-ever emergency measure of odd-even scheme for cars by the Delhi government in January 2016. But irate car users contested this in the high court. We had to gather evidence of pollution and congestion reduction gains to build support for emergency action. With the odd-even scheme, the city understood the benefits of reducing car congestion. Bus and metro services improved, fuel consumption too reduced, and commuting became quicker. The city now needs to take permanent measures to sustain these gains. The question we are asking ourselves, and you our reader, is whether smog 2016 is a sign of things to come? Or will it be the turning point where we force the pace of intervention so that we can, indeed, go through winters without any hazards? It can be done. 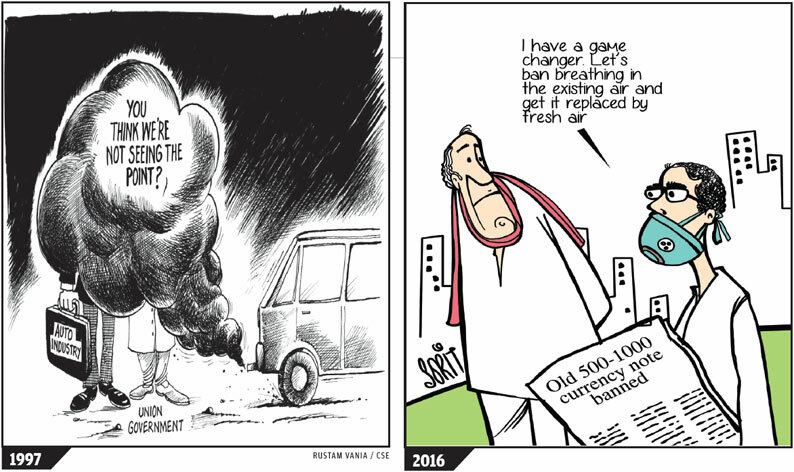 In the late 1990s, when Delhi’s air was just as bad, we did make a difference. The struggle to bring in CNG was not easy. It happened because the judiciary took the lead and the government was forced to take action. But now things are complicated. This second generation reform requires finding solutions to mobility. Currently, we are only cleaning up vehicle technology and fuel, but with larger number of vehicles on the roads, the gains are negated. But reinventing mobility is tough. This has been our most difficult of battles. The fact is that people who travel in buses, who walk or cycle, are invisible to us in cars. We own the roads. When we go abroad, we will take a bus or a subway (underground or metro). But not here! Why? There is a class system at work—it is not for us, but “them”. This class system makes its way into the mindsets of planners and engineers, as all cities are designed to make sure that we cannot walk; cross a road and certainly not cycle. We need enforcement on all sources—from dust to garbage burning. For long, cities like Delhi have pushed away their pollution to where someone else lives. It will not work anymore. Delhi also needs to “persuade” farmers in Punjab and Haryana not to burn their paddy. But this needs incentives and it needs us to get our own house in order. Though buses, three-wheelers and taxis are today switching from diesel to CNG, cars and SUVs, which carry the rich and powerful, cannot be touched. The argument is that by 2020 we will have “clean” diesel technology—this is when petrol and diesel emissions get equalised. But the Volkswagen scandal shows that even “clean” diesel needs a cheat device to make it “clean”. In this way, toxicity will grow. The carcinogenicity index of diesel will poison and kill us. This is no longer slow murder, but fast and deliberate murder. Will we succeed? Or will we fail? Our story is your story today and tomorrow. We are not going to give up. So let us make this work. We must. Dear Sunita and Anumita, Heartfelt thanks and congratulations for so brilliantly documenting the journey of a non-profit for public good. The lesson I carry from your piece, especially in these times, is that it is so very important to not to lose hope, and to carry on doing one's job in the face of what may appear to be insurmountable odds.